More representative, at least in its number of oars, is the Gokstad Ship, with sixteen on a side. 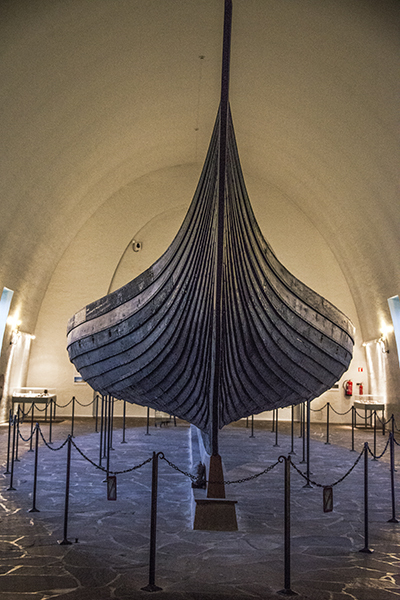 The finest and best preserved of the Viking longships, it was excavated at Gokstad, near Oslo, in 1880. A thousand years before, the ship had served as a burial chamber, preserved under a barrow of impermeable blue clay. Seventy-six and a half feet long, seventeen and a half feet wide, and less than six and a half feet deep from the keel to the gunwale at midship, the keel, itself, was almost fifty-eight feet long. It is the length of the keel, in fact, that determined the size of such a ship. Constructed of a single piece of oak to ensure strength, there cannot have been too many trees that would have yielded straight timber much longer than that. The remnants of thirty-two shields, alternately painted yellow and black, were found along each side, two for each oarport, which seems to indicate a crew of approximately the same number or possibly twice that if they rowed in shifts. Overlapping one another, the shields hung from a batten on the uppermost strake. Once under sail, the shields were at risk of being washed away and, while the ship was being rowed, they would have covered the oarports. Such a display, therefore, presumably was ceremonial and decorative. The oarports were cut at the second strake of the ship, which permitted a higher freeboard than if the oars had been secured by oar locks on the gunwale and offered an advantage over the enemy. There also were oars and spars, tubs and kegs for food and water, and even remnants of the woolen sail cloth, which often was interwoven to give a checkered or striped pattern (e.g., Heimskringla: St. Óláf's Saga, CXXIII; or the striped sails depicted in the Bayeux Tapestry). A rudder or steering board was affixed to the right side of the ship, its name providing the origin of the word "starboard." Curiously, there were no benches (thwarts) for the oarsmen, who probably sat on their sea-chests. There were found, however, the bones of a peacock, which must have seemed exotic indeed to these Norsemen.